An intensely satisfying game of table shuffleboard happened that night. Along with four friendly glassfuls of various concoctions. One sake bomb, one large sake, 2 glorious vodka and sodas with lime and to top off the evening, chilled shots of Patron. The night was about birthday celebration and the joys of slapping 27 in the face and giggling about it. The next morning 27 explained that it doesn’t take those slaps so nicely. A few nice sprinkles of sweet sleep happened, then I drank a few big chugs of coffee and hopped in Old Blue to meet the ladies of Vim+Vigor. After a quick tour around the facilities, Elizabeth Portman Black, new mother and Co-Founder gave me the juice behind Vim+Vigor. It happened in 2012. That’s when Liz and her Co-Founder/cuzzo Annie began tinkering with the idea of juicing. At the time Liz was living in the Big Apple. She began checking out the juicing scene and how people were starting to replace their cups of Joe in the mornings and afternoons with juice. After checking out the scene a bit more, she and Annie discussed it and began diving headfirst into juice. “When we started it was Annie and myself doing all the juicing and the delivering. Staying up all night and delivering the juices,” Liz explained. Imagine it people, 21 hour work days. “We didn’t have any inventory, we had to make as much as we could before delivery the next day. It was terrible,” Annie explained. 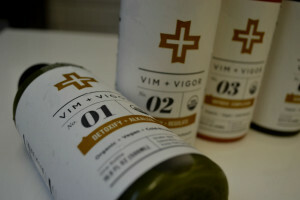 In less time than it takes to say ‘juice’, Vim+Vigor has made its way to all of the Whole Foods in Texas. Not to mention selling the good stuff online and at the upscale Number One in Highland Park Village. But how do they do it? It all starts with fresh one hundred percent organic fruits and vegetables that are ground down to a fine pulp. The pulp is pressed with something like 20 tons of pressure. After all that stuff happens, the pulp left over is filtered out. According to the ladies, this is key. Your body has to break down the pulp, but the juice goes smack dab into your system creating immediate benefits. Once bottling is complete the fun really begins with the High Pressure Pascalization process or HPP. The bottles are submerged in a cold water hyperbaric chamber while an even amount of pressure is applied. The pressure reaches depths similar to the bottom of the ocean (that’s a lot of pressure). HPP inhibits the bad stuff like potential salmonella, e coli, listeria and anything else that can be in fruits and vegetables. So this stuff is super good for anyone to sip on. Each juice has a unique combination and flavor, something that both Liz and Annie agreed were extremely important. After all these juices are predominately veggie based and it’s not always an easy fete to make veggies taste good. “We worked with a registered dietitian formulating the blends for the benefit, and then we tweaked the taste, so we kind of did what we thought tasted good, and paired well together to achieve certain benefits. 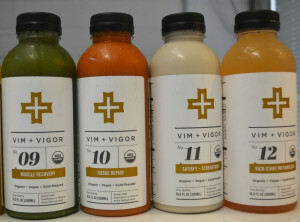 The juices are numbered 1-12, with most being completely veggie based. morning, No. 3 and No. 10 are great because of the carrot base. Now if you are really feeling froggy, may I suggest No.2. This distinctive juice is a fascinating concoction of beet, cucumber, apple and lime. Now we all know beet can be pretty off putting with its earthy murky flavor, but somehow Liz and Annie gave it a delicious makeover in this juice. The lime paired with the beet gives the juice a bit of a tang, while the cucumber adds a sly coolness to the earthiness of the beet. All in all they work masterfully together. And, the best part about this one, it’s great for the liver. “Beet is such a good juice. It scrubs your liver. It’s great for hangovers, it brings oxygen to your blood,” Liz said. According to Liz even Olympic Athletes drink beet juice and it can enhance performance by nearly 3%. 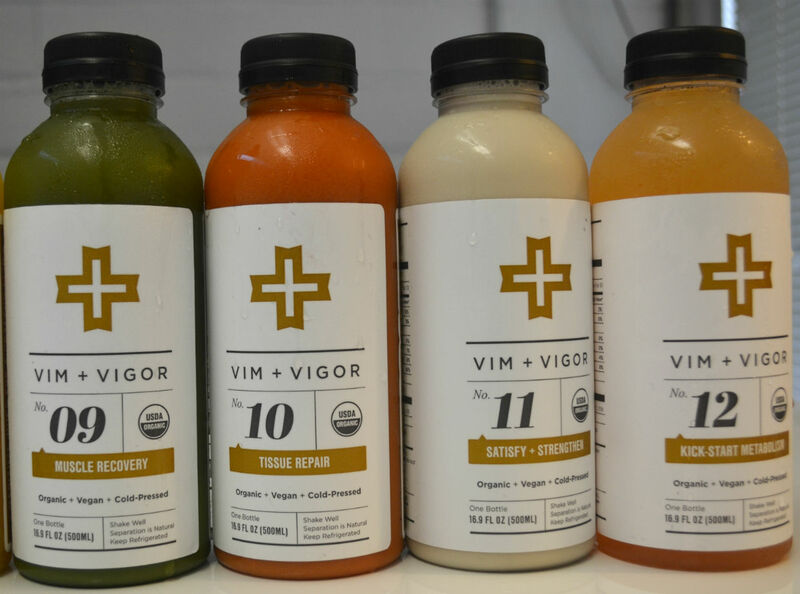 Vim+Vigor focuses primarily on cleanses. They range from beginner, intermediate and expert cleanses. They even give you dinner option recipes. “You can still eat. Sometimes it’s just the chewing that people miss, drinking for an entire 3 days or five days can sound intimidating,” Liz explained. 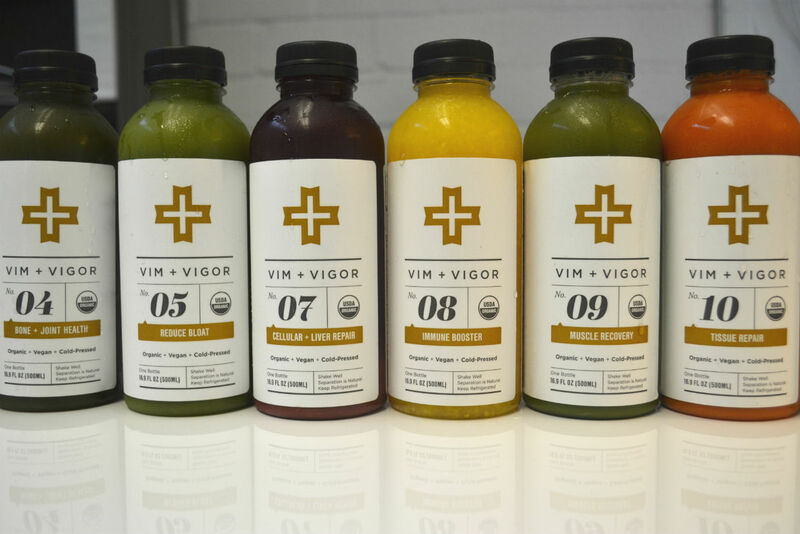 Though most juicing companies put their sweeter juices first in a cleanse Vim+Vigor does things a little different making their vegetable dense juices part of the beginner cleanse. They do this, according to the ladies, because most beginners aren’t the healthiest eaters, and sweeter juices will only activate your internal yeast. By the time you’re at the expert cleanse you’re able to have the fruitier juices, so yay. 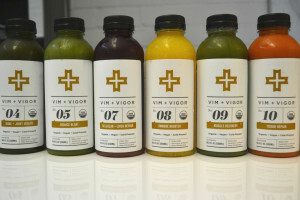 Even if you don’t want to go the whole cleanse route, using the juices as more of a supplement is just as wonderful. Remember guys, there are 6lbs of produce in each bottle. Who has time to sit and eat that daily, why not drink it? Where to find them-Online, Any Whole Foods location in Texas and Number One in Highland Park Village. Plus several other places in DFW.